This installation of traditional sweets using textiles is significant on many levels. Firstly, The sweets are instantly recognisable as traditional sweets available in Ireland for generations. That recognition allows people who usually feel excluded from ‘art’, a way to experience the art in a non challenging way. Someone who is experiencing art for its visual or aesthetic qualities is no less valuable in the art world than the person who understands the process of making art and will be curious about the ideas, mindset and motivations of the artist. 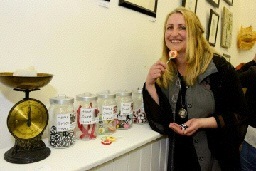 Secondly, and a little deeper is that fact that the sweets are contained in jars. This is significant in the debate around textile art and its begging to be touched and ‘felt’ if you pardon the pun!. To touch or not to touch is important, while I had thought I would like people to experience my art with as many of the senses as possible. But when I see people actually take the covers off the jars and put their hand in (and take one on occasion!) I do feel to some extent violated and the work diminished on some level to that of a commodity. I did think, perhaps, that the art viewer and the craft viewer might be different in this sense. The fact that you usually pick up a craft item to see how it is made or to find the mark of a makers hand before you purchase. So I thought by not putting a value on my art or having any items for sale might prevent the need to touch but with some apparently not. Thirdly, they are about memory and bottling the happy memories of my childhood which otherwise could degenerate into the grey wet images of Angels ashes. Where was the colour and joy, where better to find it than in a sweet shop or a stationery shop. The multi coloured displays of sweets and stationery with the sickly sweet smell – yes, even then they knew the power of selling by the senses – why else would you have sweet flavoured erasers! So strong was this joy that I even ended up owning a newsagents. Finally, on my own journey these sweets are significant in that I discovered the joy of making and a love of repetitive tasks because they can slow down my thinking and act as a meditative process. This intensity of time bound repetitive actions also has the contradictory effect of bringing a feeling of freedom – for me it is that freedom comes from a ‘knowing what to do’. A freedom from always ‘making it up’. A freedom from conceptual thought and figuring out what to do next; and a freedom from the fear of making a mistake. I am about the truth. My own truth, feeling the truth and speaking the truth. But the truth is we can’t handle the truth! Everything is about ‘living in the moment’ but most prefer to live either in the future or the past. That’s because we find most comfort there. We make most of our decisions out of fear whereas we would be much better off making decisions out of love. We are usually driven by two motivations – we either crave something or avoid it. That is how easy we are to read and therefore to be manipulated. This is not good for the soul. Did you ever find yourself doing something that you don’t want to be doing and wonder how you ended up in that situation? Well firstly, the good news is that you have been given an awareness or insight into the dissonance that your being is experiencing. Most people are blissfully unaware just how miserable and unhappy they are, in fact, quite the opposite they are happy in their misery once they have become comfortable with it. They seek out others who will understand and reassure their situation. To them a problem shared is a problem halved! If you happen to be that person and you are determined to keep them in your circle then you have to learn to leave their negativity with them and letting it go through you without having lasting effect. Do not take it on! Of course, fixers and givers are not only a prime target but may also be actively seeking these miserable and unhappy individuals. All of this dynamic can be heavily disguised in a thinly veiled, sickly sweet, candy coated personality that makes it difficult to immediately identify. The only answer is to become aware – VERY AWARE!